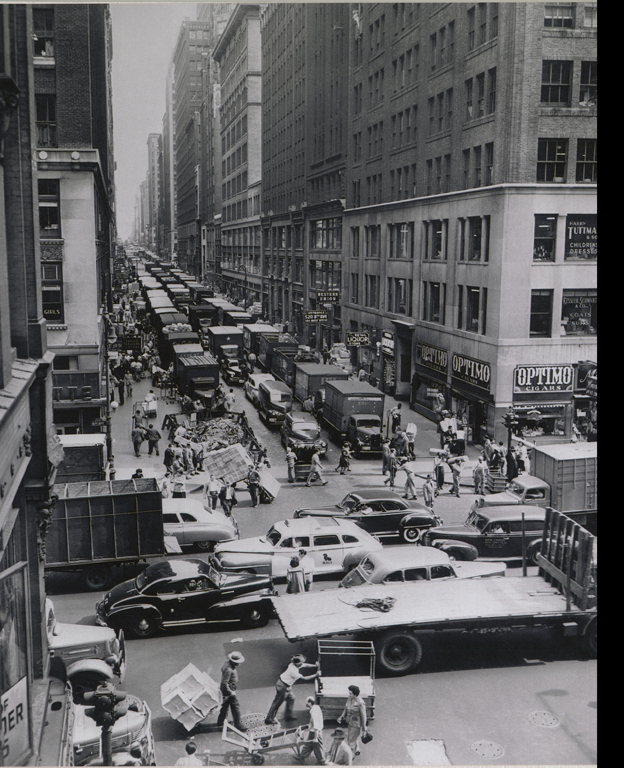 West 37th Street looking east from Eighth Avenue, c. 1950. Collection of Andrew S. Dolkart. The streets of the Garment District teemed with activity during working hours. Trucks densely parked along the curbs delivering bolts of fabric and picking up finished garments that were transported locally from contractors to jobbers, or from factories and stockrooms to merchants across America. Sidewalks were blocked by piles of boxes or racks of clothing awaiting pickup. Many short distance moves-perhaps from a contractor's shop on a midblock to a jobber's showroom on Seventh Avenue-were by racks or carts, maneuvered deftly by "push boys" through the crowded sidewalks and streets. Streets were especially busy in the early morning and late afternoon rush hours when workers hurried to work or streamed to the subway lines that would take them home at the end of the day. The most congested time though, was the noon hour, when thousands of workers poured onto the streets to grab a quick lunch at one of the many neighborhood cafeterias and luncheonettes on the ground floor of the lofts or in the freight lobbies. Most of these workers were men, since women generally brought lunch from home and ate together indoors. According to a writer for the ILGWU "noon is the signal for concentration twice multiplied. Thousands of workers niagara out to the streets, jam the sidewalks and flow over the curbs nonchalantly blocking traffic. . . . They crowd into the numberless cafeterias dotting the district, congregate over food and talk, then flood back across the pavements, perhaps for a cigarette and more talk in the warm sun."